Click the Work Day command on the Options menu. Right-click the task tray icon and select the Work Day command from the Options submenu. Click the Work Day tab in the Options window after it has been displayed by using one of the other commands in the Options menu. 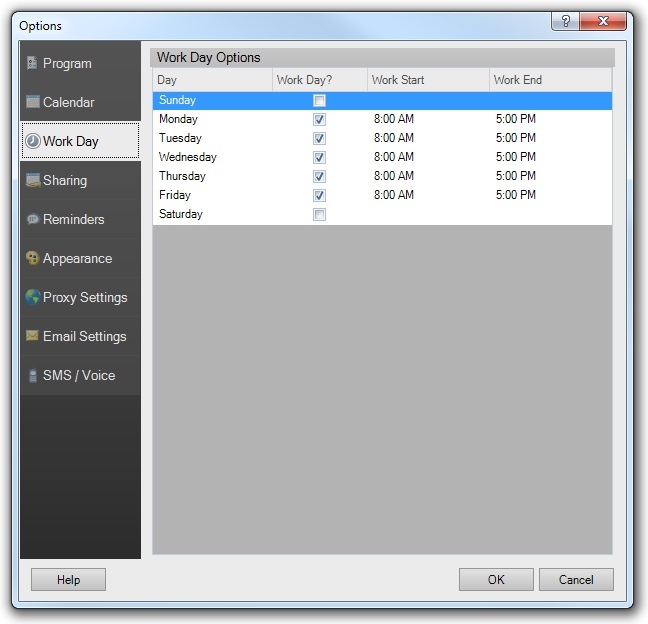 The Work Day tab of the Options Window enables definition on your work schedule. Days and times that are outside working hours will be shaded gray in the Day, Week, and Timeline Views. Each day of the week can have its own work schedule specified independently of other days. The work day options will affect the display of the Day, Week, and Timeline Views, which shade working hours differently than non-working hours. It will also affect the Daily and Timeline print styles. If a day is usually a work day, check the Work Day box. This will enable the work starting and ending times to be specified. The start and end times are the times that you normally start and end working on the associated day. You can type in any start/end time or select one from a drop-down list.